It's happening again. As Carey Price lay on the blue ice of his crease on Saturday afternoon, before he skated in a tentative circle, testing his weight on his knee, a familiar dread settled into the hearts of hockey fans across Canada. 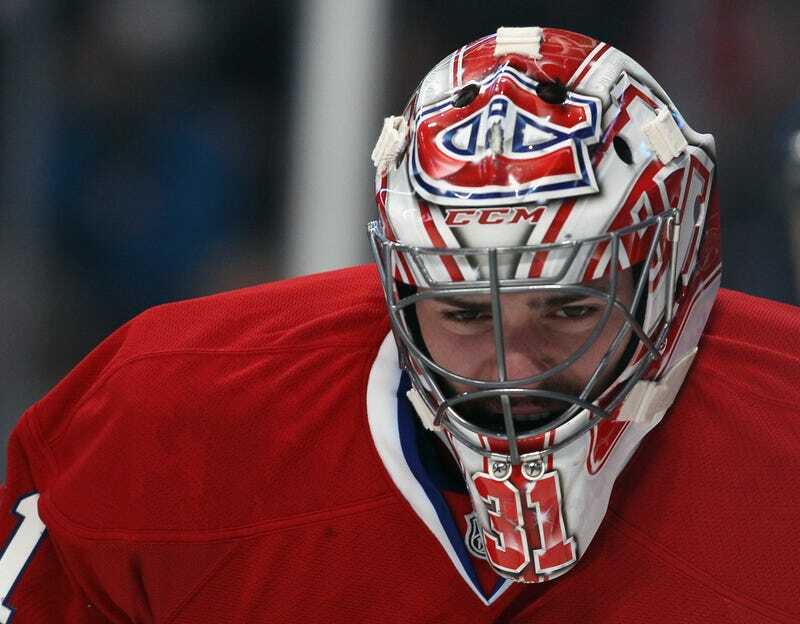 By Monday, Habs coach Michel Therrien had confirmed our worst fears: Price was out for the series. Without Price, the Canadiens have slim hopes of getting past the New York Rangers in the Eastern Conference final and challenging for the Cup. And without the Canadiens, Canadian hockey fans lose their shot at seeing a homegrown franchise win the Stanley Cup for the first time since 1993. "Who cares? It's the Habs," say the diehard Leafs fans, and no doubt plenty of other Canadian fans echo them—including that small but vocal segment of the anglophone population that seems to wish every possible ill on francophone Quebec and its hockey team. But for a lot of Canadian fans—and I'd argue the number is growing—the playoffs have become a time to root for whichever Canadian franchises have managed to eke their way into the postseason, no matter which language they sing the anthem in. For me, a lifelong Oilers fan who grew up on the border between Habs and Leafs territory, an inclusive nationalism has long since superseded regional or franchise tribalism when it comes time to play for the Cup. Once upon a time, the idea of Canada's Team™—of the nation throwing its backing behind a single franchise, whichever is the last one standing in the playoffs—would have been absurd. Habs fans have always hated the Leafs and always will, and the feeling is mutual in Toronto. The Oilers and the Flames are like, well, oil and water. The Senators and the Leafs have nursed a growing modern-day rivalry, too. And does anybody really like the Canucks? But since 1993, a gnawing fear has driven us together. The fear is this: that a Canadian NHL franchise might never win a Stanley Cup again. It's hard to believe it's come to this. Until the aughts, the Montreal Canadiens had won at least one Stanley Cup, and sometimes several, in every decade going back to the 1910s. To close the 1980s, Canadian teams won seven straight. But after 1993, the drought began, and it coincided with dark years for Canadian NHL fans. These were the years when the Winnipeg Jets departed for Phoenix and the Quebec Nordiques left for Denver, and everyone wondered who'd be the next to go. My beloved Oilers, perennially threatened with a move to Houston, hovered on the brink. The fledgling Senators just kept losing and losing and losing. Small-market Canadian teams were cash-strapped throughout the '90s, and there were times when it seemed that only Montreal and Toronto were safe from Gary Bettman's talons. The Las Vegas Flames? The Kansas City Canucks? I'd argue that it was those lean years that persuaded many Canadian fans to set aside our traditional rivalries and begin to band together to support the teams that remained. And then, in the 2000s, while the Canadian dollar staged a recovery and our teams' finances stabilized, things somehow got worse. Then came the lockout year, followed by another improbable Cup run—this time the Oilers lost to Carolina in seven. By the time a third consecutive Canadian team, the Ottawa Senators, had made it to the finals only to collapse and let a third consecutive warm-weather team—this time the Ducks—walk away with the Cup, the fear of losing all our franchises had morphed into something new: the fear that we were cursed. Call it the curse of St. Patrick. In December 1995, Patrick Roy left the Montreal Canadiens under a cloud of bitterness. The Habs' chosen one let in nine goals in his final game. Infamously, his fans turned on him, responding to an easy save with sarcastic applause, and prompting him to raise his arms to the crowd in mock triumph. When Roy was finally pulled he vowed never to play for Montreal again. He was traded to Colorado days later, where he would win the Cup that same season, and again in 2001. In the years since, Habs fans have wondered if they're suffering under a Babe Ruth-style curse. And I'm beginning to wonder if the curse might be afflicting franchises nationwide. What are the odds that not one of the six Canadian teams—seven, now, with the happy return of the Winnipeg Jets—would win the Cup for 21 years, after a century of consistent success? What are the odds that, of five Canadian appearances in the Stanley Cup finals since 1993, four of them would be Game Seven heartbreakers? (Way to let the country down easy, Sens.) The Oilers' run was derailed by an injury to red-hot goalie Dwayne Roloson when he was bowled over in game one of the finals, and now this year's Habs look to be in the same boat. Is that just chance at work? The playoffs are a stressful time for any fan. But with each year of drought, I find them increasingly, exquisitely painful. How long will we have to wait? Eva Holland is a freelance writer and editor based in Canada's Yukon Territory. Follow her on Twitter @evaholland. What Happens To Enforcers When Hockey Uses Them Up?